When starting an online business your main concern is the communication channels your customers will use to get in touch with your team. 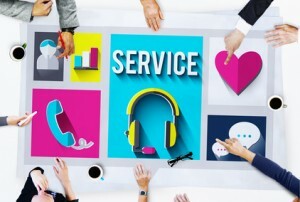 Personalized and prompt customer service gives you an edge over the bigger and more well-known competition. No matter how user friendly your ecommerce website and shopping cart are, your customers may want to contact you with some questions or just to ensure your business is “alive” and they will not be deceived. That is why it is important to offer not only a top-notch customer service, but also to provide access to various ecommerce website communication channels which your customers can use to get in touch with your customer care team. In this blog post I decided to describe advantages and disadvantages of those ecommerce customer service options which will help you to provide exceptional customer service, win loyal customers and grow your business. Live Chat has a lot of advantages for modern ecommerce websites. First of all live chat can be easily integrated with any ecommerce software. Most platforms even offer built-in modules or special integration options. 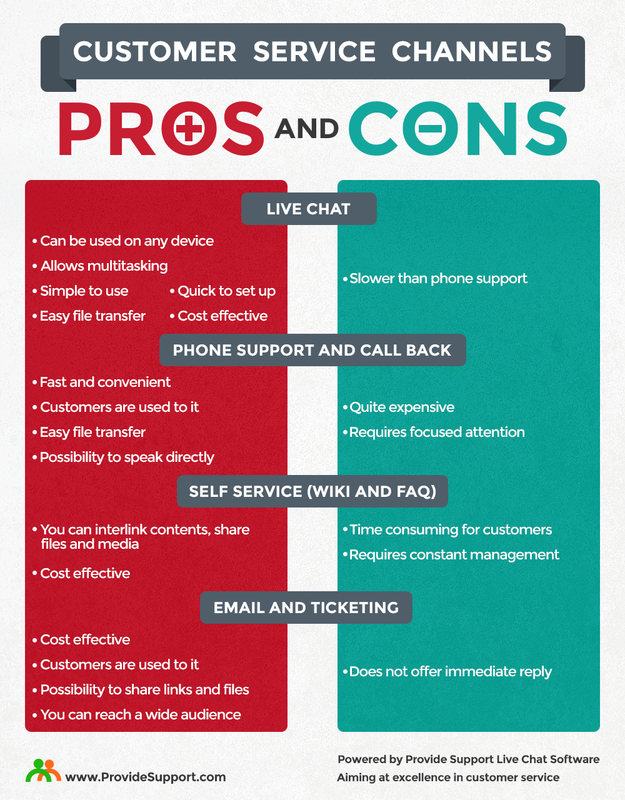 Live chat providers on the other hand offer detailed instructions for integration with various ecommerce platforms. This as a result streamlines the integration process, making it fast and straightforward. Just a couple of clicks and your customers can contact you directly while they are browsing your website. Another advantage of a live chat tool is the fact that it allows multitasking. Your customers can chat with your agents in their office or while sitting in a cafe. They can click a “live chat button” right from their shopping carts and inquire about products they are interested in or delivery terms. Your customer support agents will also be of a high opinion about the tool as besides chatting functionality it lets them see what pages your customers are staying on and what items they have put into their carts. This considerably facilitates customers support workflow and allows providing personalized and memorable customer service experience. Phone is one of the most popular communication channels. It lets customers have their questions answered in minutes. However, offering quality phone support is rather expensive. You’d need to have a dedicated customer service team to handle your phone calls. As a result this increases your customer support expenses and impacts the price of your products or services. There are also cheaper options: call back service and voice menu. These options imply that phone support is not your main customer support channel. However, your customers can use them if necessary by requesting a call back or by connecting to your operator after checking the voice menu options. FAQ section is a must for any type of business as it covers the most common questions your customers may have. In addition to the FAQ section you can offer a Knowledge base in case your customers may have some technical queries. FAQ and Knowledge base are quite cost effective support options and require only management to keep them up to date. Most customers prefer checking FAQ section before contacting company’s support. Thus offering these self service options will save not only the time of your customer service team but will also positively impact your customer support expenses. Email is a customer support option which is offered on all websites. All companies provide their email addresses or offer a leave a message form on their websites. In addition to listing your emails, you can offer your customers to create tickets in special ticketing system. In this case your customers will have a ticket (case) number to refer to. By integrating a ticketing system into your customer support workflow you will have your emails ordered and will be able to track all communications from one tool. Today social media networks have become the go to place for getting a response from a brand. Lots of customers prefer asking their questions on Twitter or Facebook and expect to receive quick responses concerning their queries. This brings customer service to another level making it public. In this case it is very important to keep an eye on social media and monitor all questions being asked there. Neglecting social media as a communication channel will have a negative impact on your brand. However, when you reach out to your customers through social media, this creates an atmosphere of trust and helps to build an audience of loyal customers. This entry was posted in Articles, Infographics, Tips and Tricks and tagged customer support channels, ecommerce website communication channels. Bookmark the permalink. Straight to Pinterest with that chart! Nice job keeping this succinct and still helpful/with some depth. Support is increasingly a saturated field these days where it can be difficult for people to know which tools to turn to! Thanks again! Thank you for your comment, Brandon. I am glad you found this article and infographic useful. To choose a best Customer support option for your e-commerce site you have to choose a professionals team that has expertise in your domain that can resolve the query of users and able to provide a quick response of all type of errors.